The cherry blossoms are officially blooming which means Spring is finally in the air... and it also means a little change-up to my regular skincare routine. 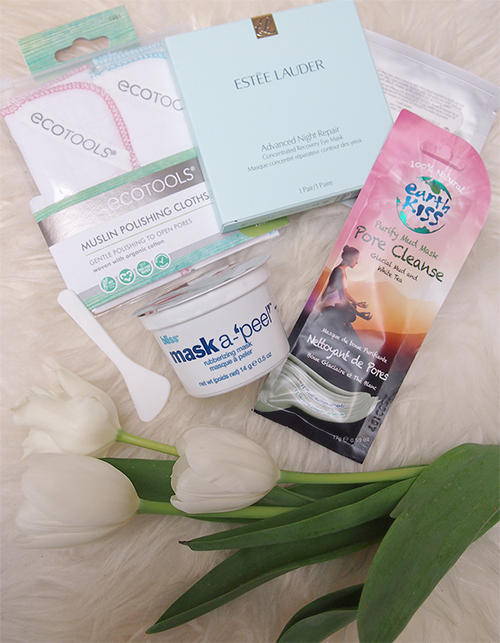 I've received a few new products over the past few months to try out and they've made some quick and easy additions to my "pamper time." I have previously raved about the Estée Lauder Advanced Night Repair Intensive Recovery Ampoules and the company recently introduced an Advanced Night Repair Concentrated Recovery Eye Mask. The packaging is quite unique; the mask pads are separated from the serum and you press down to break the seal and infuse the dry pads. It's kind of a luxe treatment at $14 CAD/pack but what a treat! Plus, you can refrigerate the pack beforehand for some extra refreshment. In keeping with the treatment theme, face masks continue to be my favourite. Earth Kiss is the organic line from Montagne Jeunesse (which I've reviewed before) of cruelty-free and 100% natural mud masks infused with Himalayan Shilajit, a rare form of powerful mineralized organic matter. The masks are also super cheap -- only $2.99 CAD/pack. For something more unconventional (and more expensive), there is Bliss Mask A-'Peel'. These cost $15 CAD for a one time use but I'll admit it is kind of a fun concept for an at-home facial. You add water to the powder mixture, stir it up with the enclosed spatula, and apply the thick paste to your face. Once on the skin, it dries to a rubberized texture which you then peel off after 15 minutes. Lastly, I've been experimenting with EcoTools Polishing Facial Cloths ($10.99 CAD). I have never been a wash cloth kind of girl (I just use my hands to apply cleanser and wash my face), but these muslin cloths are a nice way to really clean your skin and remove all traces of makeup without feeling too harsh. That pore cleansing mask looks great! Spring is definitely a good time to amp up your skincare routine!